Generics and Biosimilars Initiative Journal (GaBI Journal). 2012;1(2):69-83. Author(s): Brian Godman, BSc, PhD, et al. Introduction: Pharmaceutical expenditure continues to rise driven by a number of factors including ageing populations and the continued launch of new premium-priced drugs. Increasing use of generics versus originators and patent-protected products of the same or related classes can help conserve valuable resources. However, concerns with their effectiveness and safety compared to originators as well as only limited introduction of measures to promote their demand in some countries have led to variable use among countries. Countries need to learn from each other to further enhance their prescribing efficiency. Study Objectives: Firstly to review successful case histories from different countries, and secondly, raise awareness about potential pitfalls that could undermine the success of future measures in order to provide future guidance on conserving resources in relation to generics. Methods: A narrative review of case histories selected by co-authors using a range of different approaches. Systematic reviews are published elsewhere. Results: Twelve case histories were selected depicting both supply- and demand-side measures. These include Croatia where the introduction of additional measures helped reduce drug expenditure as well as debt whilst improving access to new medicines, Lithuania where recent reforms decreased pharmaceutical expenditure in 2010 whilst the number of prescriptions increased by 9% versus 2009; Scotland where despite a 6.2 fold increase in statin utilisation, multiple measures limited the increase in reimbursed expenditure to just 7% in 2010 vs 2001; Sweden where the introduction of monthly auctions for generics has helped lower prices; and the US where managed care organisations actively encourage cross therapeutic opportunities for generics substitution where the safety and efficacy of a generic drug is similar to a patent-protected product in the class or related class to conserve resources. 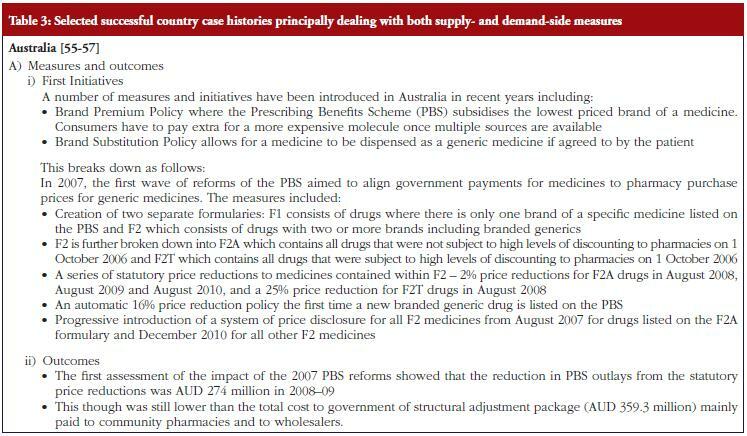 Conclusion: Payers across Australia, Europe, Middle East (United Arab Emirates), and US have introduced multiple measures to both enhance the prescribing of generics and obtain lower prices, with the result that they are increasingly able to take advantage of the availability of generics. However, due to growing pressures on healthcare resources, it is important that countries accelerate the sharing of lessons learned about which policies and new measures are most effective in controlling costs. There is increasing scrutiny over pharmaceutical expenditure in view of its greater growth compared with other components of health care . Pharmaceutical expenditure currently accounts for up to 60% of total healthcare costs in some countries . This increasing scrutiny has stimulated many reforms and initiatives to moderate future growth. These include measures to increase the prescribing of generics versus originators at lower prices than originators; other measures aim to increase the prescribing of generics versus patent-protected products in the same or related classes [3-18]. Our paper in the first issue of the GaBI Journal gave examples of the different supply- and demand-side measures that are being used by health authorities and health insurance agencies to achieve these aims . The objective of these measures is to help maintain comprehensive health care, particularly in Europe where there is continued pressure on resources, without prohibitive increases in taxes or health insurance premiums. One reason for the pressure on resources is the continued funding of new innovative premium-priced drugs. Additional measures stem from an increased volume of drugs being used due to stricter clinical targets, rising patient expectations and ageing populations [3-5, 8, 9, 11, 19]. In Europe, in order to receive market authorisation, generic medicines have to demonstrate they have the same qualitative and quantitative composition as well as the same pharmaceutical formulation and bioavailability, as the originator medicine [20-23]. In addition, there must be no prior intellectual property associated with the generic drug [20, 22, 23]. In view of this, payers typically assume that if two medicines have the same bioavailability they should have a similar therapeutic effect. This appears generally to be the case and applies even when the generic drug is in the form of a different salt to the originator as well as different indications initially, as seen with generic clopidogrel . Two recent comprehensive reviews illustrate this by comparing the outcomes between generic and originator drugs for the treatment of two widely different dis­eases [25, 26]. The ﬁrst review considered treatments for epi­lepsy and found no evidence of association between loss of seizure control and treatment with at least three types of anti­epileptic drugs, one of which was phenytoin . Similarly, the second review, which focused on the treatment of cardio­vascular disease, did not demonstrate superiority in outcomes for originators compared to generic drugs . This included drugs with a narrow therapeutic index such as propafenone and warfarin . Therefore, generic medicines can help con­serve valuable resources without compromising the quality of care [1, 3-6, 8, 13-17, 20, 27]. Many different measures and initiatives have increased prescribing efﬁciency in Europe, and are summarised in a previous edition of the GaBI Journal [1, 27]. These resulted in generic medicines in Europe comprising 50% of the volume of dispensed drugs but only 18% of the expen­diture on drugs in 2006 [19, 28], leading to estimated annual savings of Euros 25 billion per year among the 27 nations in the EU . Expenditure on generics in Europe was 21% in 2007, with the EU accounting for 30% of worldwide sales of generics in 2007 . The extent of the savings is helped by estimated price reductions of between 30% to 90% for generics versus originator prices just prior to patent loss, with typically between 10 to 30 manufacturers competing to supply the differ­ent generic products in each market [20, 27, 28]. In the US, the prescribing of generics is also gaining ground. For example, published studies have consistently shown that among managed care organisations (MCOs) co-payment tier levels three and four are associated with decreased use of pre­scription drugs . This even applies to patients with chronic conditions with higher morbidity and mortality such as dia­betes, hypertension and hypercholesterolemia . On the other hand, there is improved adherence to drug therapy if patients are prescribed generic drugs with typically the lowest co-payment levels—Tier One . These ﬁndings  are fur­ther substantiated with recent research reporting that ‘dispense as written’ requests from physicians in the US, aimed at reduc­ing generics substitution leading to higher co-payments, were again associated with decreased rates of prescription ﬁlling . However, there are concerns with the effectiveness and tolerability of generics compared with originator drugs [3, 7, 24, 31-37], with some originator companies questioning the quality of generics as part of their marketing strategies to reduce the ero­sion of sales which follow patent loss . Whilst these con­cerns typically only apply to a minority of situations [34, 36, 39], as demonstrated for instance by ‘dispense as written’ prescrip­tions only accounting for 2.7% of prescriptions written by phy­sicians in the US , failure by health authorities, physicians and pharmacists to adequately address these concerns will mean reduced savings in reality [3-5, 17, 40]. Potential concerns regarding the effectiveness and tolerability of generics, and associated reduced savings from lower utilisation rates, have stimulated health authorities and health insurance agencies to instigate new initiatives to address these concerns, see Tables 1, 2 and 3. There are also concerns among payers at the considerable varia­tion in the price of generics. These can vary up to 36 fold among European countries and India, and greater than 50 fold among developing countries, depending on the molecule [2, 4, 20]. The price differences are independent of the population size of the country or levels of income [10, 41], and are leading some countries to continually review their generics pricing strategies so as to enhance resource savings [3, 4, 7, 9-16]. There is also wide variation across Europe in the utilisation of generics versus patent-protected products in the same class or related class [4, 5, 8, 11]. Reducing this variation will likewise enable payers to conserve additional resources as generic drugs become increasingly available [4, 8, 12, 13]. In the future it is likely there will be further expansion in the manufacture and availability of generics, given the likely size of the market. For example, global sales of pharmaceuticals were estimated at US$820 billion in 2009 . However between 2011 and 2016, products with current sales of US$255 billion per year are likely to lose their patents . This is in addition to high volume products that have already lost their patents in the past decade including various proton pump inhibitors (PPIs), statins, selective serotonin re-uptake inhibitors (SSRIs) and angiotensin converting enzyme inhibitors (ACEIs), helping to conserve resources [1, 4, 5-9, 11, 16, 18, 43]. As a result of the burgeoning availability of generics, and the concerns outlined above, payers need to continue to learn from each other regarding potential additional measures to further conserve costs as resource pressures grow. The principal objective of this paper is to produce guidance on potential ways to conserve resources around the use of generics especially to payers of health care. To this end, this paper ﬁrstly reviews measures that have been successfully introduced in dif­ferent countries; secondly, potential pitfalls that could arise. The latter needs to be heeded to optimise potential savings from the increasing availability of generics. This is a narrative review of case histories. There is no system­atic review of initiatives to enhance the utilisation of generics at low prices since these reviews have already been undertaken and published elsewhere including those by the co-authors [4, 5, 8, 11, 18, 27]. The case histories have been selected by co-authors to meet the objectives of the paper rather than document a speciﬁc number of case histories from each continent. They have been divided into those predominantly concerned with supply-side measures, those predominantly discussing demand-side measures, those combining both approaches, and ﬁnally those where payers have not always been able to fully realise potential savings. Where possible, each case history documents the measures undertaken as well as the outcomes. No set format has been used to document the measures undertaken as their nature varies by country depending on the current situation and circumstances. In addition, in some countries there is an iterative approach to successive reforms such as Australia. Whilst this may represent a limitation to the study design, we have counter-balanced this by including as co-authors those directly involved in implementing the reforms. Consequently, we believe this approach provides the most comprehensive and accurate insight into the situation in the respective coun­tries. This approach has worked well in previous publications [1, 3-11, 14-18], and is seen as preferable to obtaining informa­tion solely through interviews. As discussed under methodology, selected case histories have been divided into those predominantly concerned with supply­side measures, see Table 1; those documenting predominantly demand-side measures, see Table 2; as well as those combining both approaches, see Table 3. 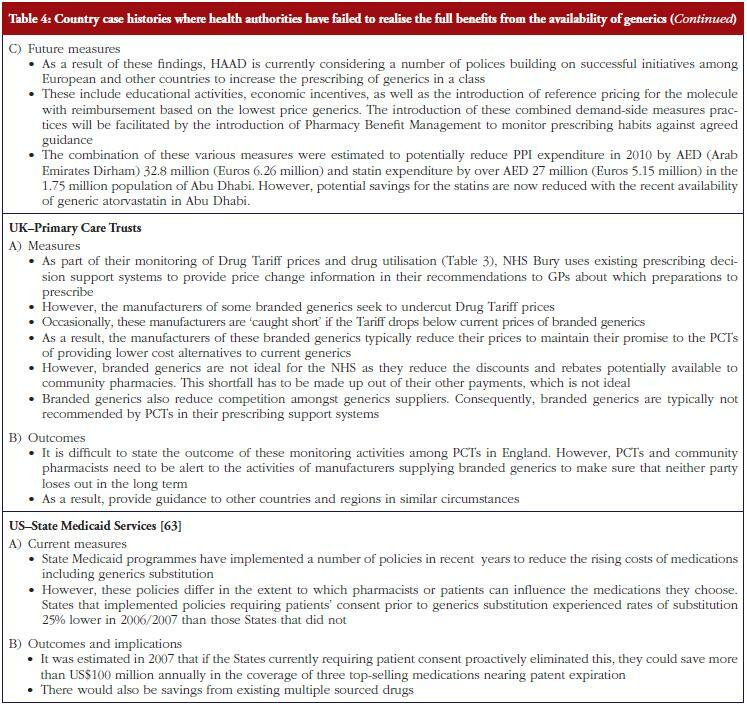 However, there have been situations where health authorities and health insurance agencies have failed to realise the full resource beneﬁts from the availability of generics, although this is changing through the instigation of additional measures, see Table 4. 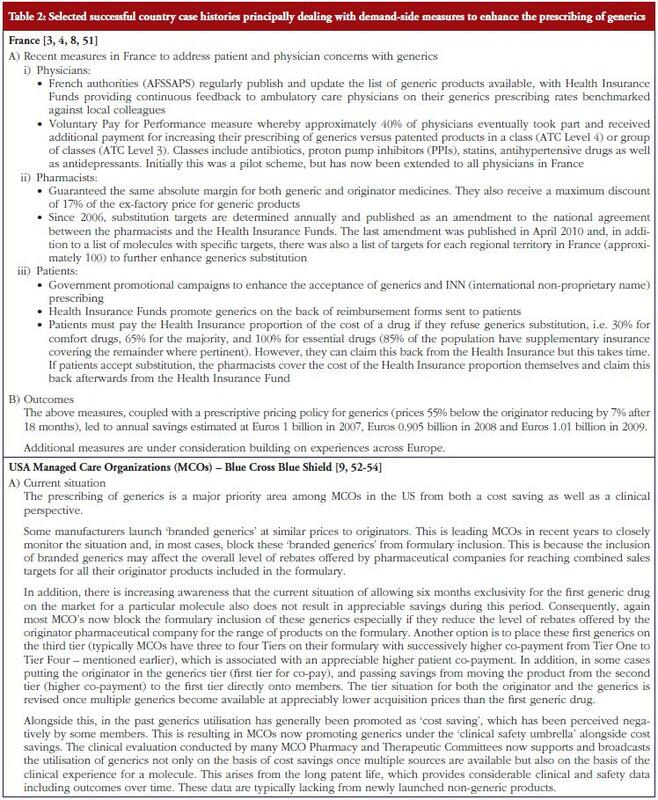 As can be seen in Tables 1 to 4, payers across Europe, Middle East (United Arab Emirates), Australia and the US have intro­duced a range of measures to try and enhance the utilisation of generics as well as obtain lower prices, in order to try and maximise the opportunity that generics provide for conserving valuable resources. Successful supply-side measures include aggressive pricing of the generics as seen in Lithuania, see Table 3, as well as increased transparency in the pricing of generics to further lower generics prices. The latter is seen in the UK, see Table 3. 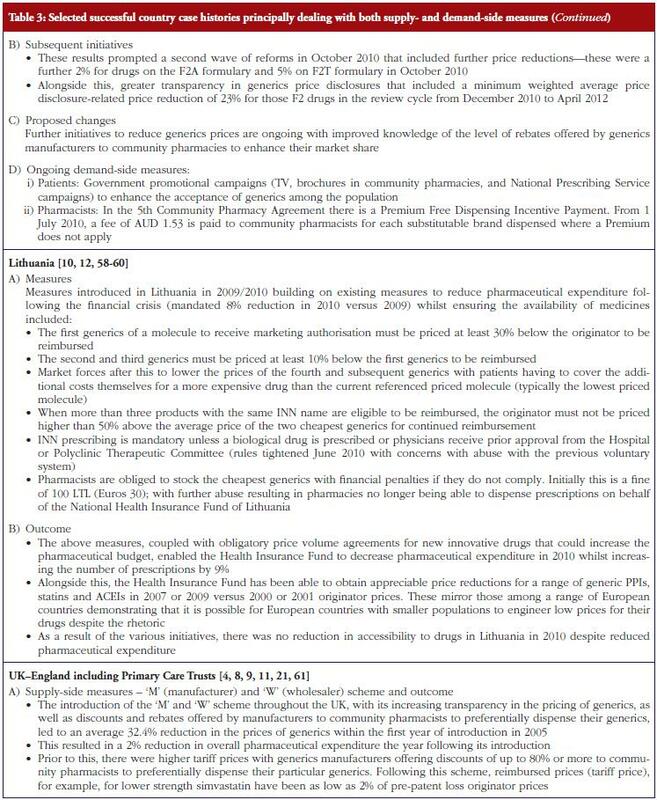 As discussed, the situation in Lithuania, see Table 3, demon­strates that it is possible for European countries with small populations to obtain low prices for their drugs despite the rhetoric [10, 60]. As a result, this helps to continue providing access to drugs even though drug budgets are being cut. 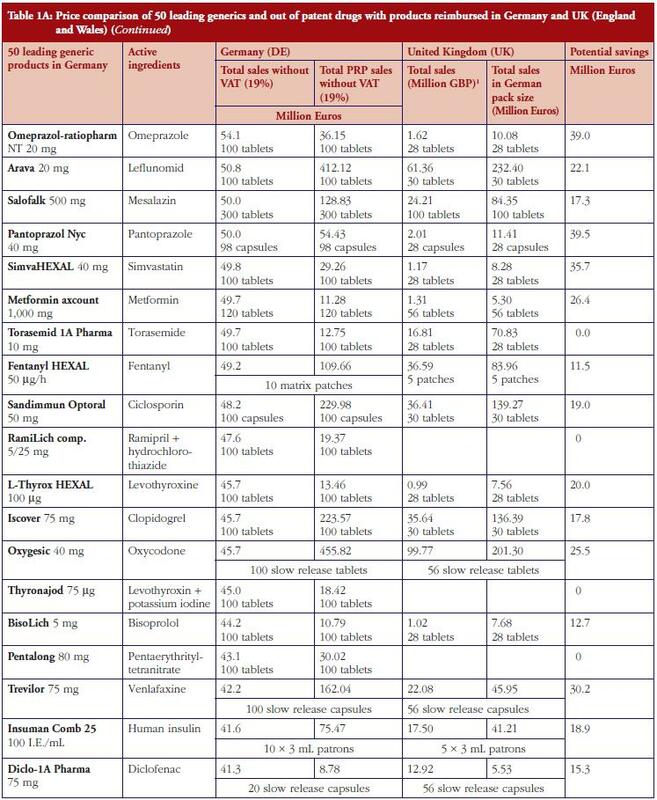 This is also seen in Croatia with their extensive range of princi­pally supply-side measures, see Table 1, regarding the pricing of generic and other drugs for the molecule (ATC Level 5) as well as the class (ATC Level 3 and 4). The various measures in Croatia helped engineer sufﬁcient budgetary space to reduce the budget arrears to pharmacies as well as increase the avail­ability to new drugs . The monthly auction for generics prices in Sweden is a novel approach, which can potentially be transferable across countries. However, more analysis needs to be undertaken before this can occur, see Table 1. 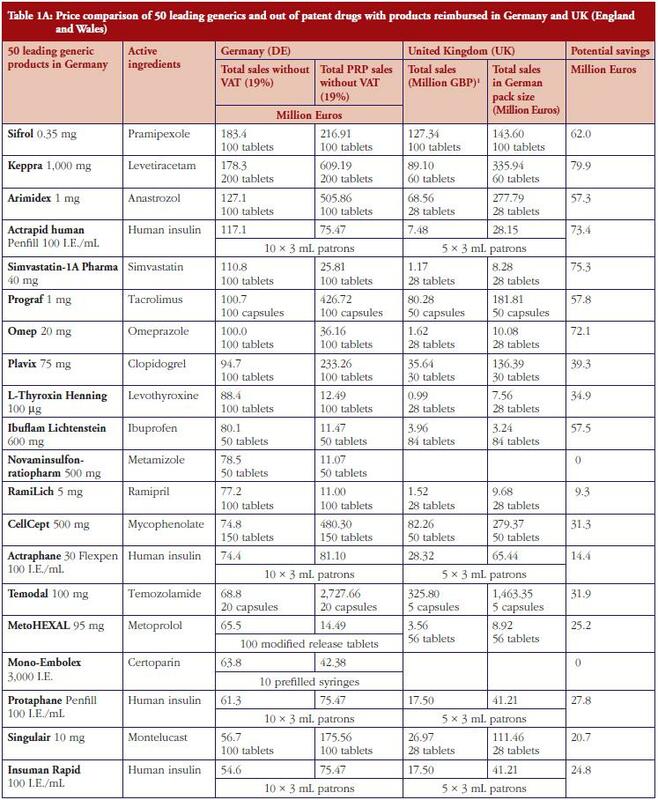 The speciﬁc contracting between pharma­ceutical companies and individual sickness funds in Germany is also an interesting development, see Table 1. 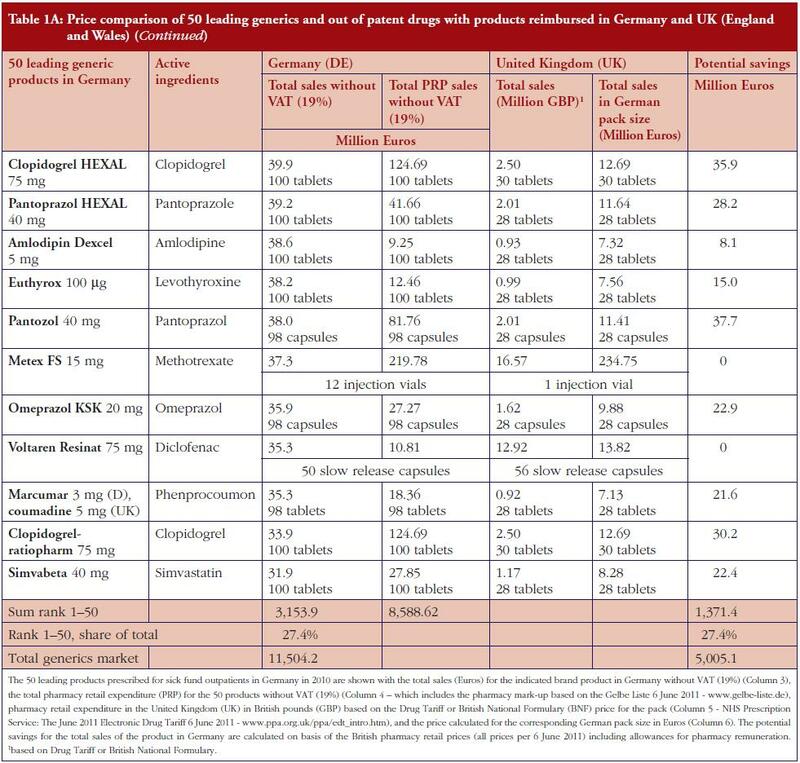 However, poten­tially greater savings could occur through more aggressive pric­ing policies for generics, see Table 1A. These though may take considerable time to implement; consequently, current practices in Germany could be a good compromise. Demand-side measures to address physician and patient con­cerns have been successfully introduced in France leading to appreciable savings when combined with prescriptive pricing policies for generics, see Table 2. As a result, this provides direc­tion to other countries faced with similar concerns. Similarly, the recent initiatives among MCOs in the US to enhance the use of generics within a class to improve both the quality and efficiency of care, especially where the outcome and safety of new drugs has not been established, also provides direction to other countries. This mirrors the situation in for instance Stockholm in Sweden with its ‘Wise List’ of approximately 200 recommended drugs in ambulatory care . These are predom­inantly well-established generic drugs, with a recent ecological study showing no difference in surrogate measures in patients with diabetes, hypertension of hypercholesterolaemia between patients prescribed well-established generic drugs compared with those prescribed patent-protected drugs; however consid­erable differences in costs . 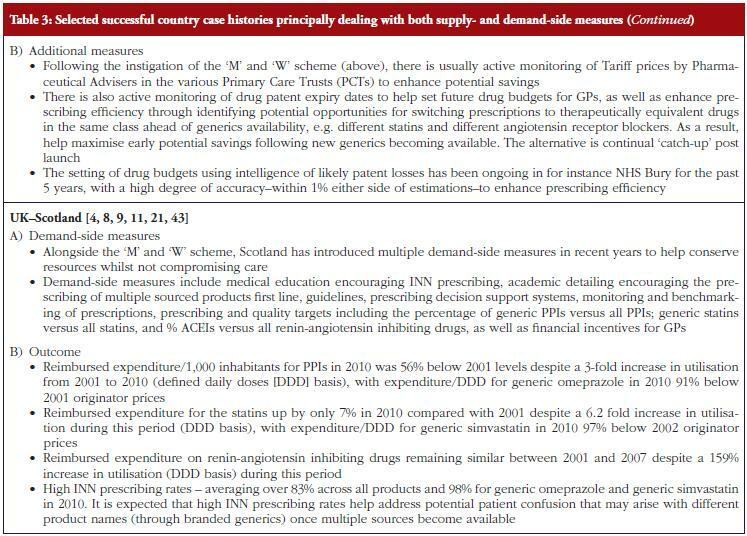 The combination of multiple supply- and demand-side measures has appreciably improved prescribing efficiency for high volume drugs in Scotland, also providing direction to other countries, see Table 3. An important message, based on the experiences of NHS Bury, is for health authorities and health insurance agen­cies to pro-actively monitor products shortly losing their patent and plan for this through switching and other activities where this is possible, see Table 3. As a result, fully capitalise on gener­ics as soon as they become available. Additional measures to enhance the prescribing of generics include compulsory or voluntary INN prescribing. This has the potential to reduce patient confusion where patients are prescribed a different brand of generics at each pre­scription [9, 66] as well as the potential for duplication of prescriptions. In addition, reduce the need for pharmacists to spend time addressing possible confusion among patients with associated costs. These issues will be explored further in future issues of this journal. Potential pitfalls to avoid, based on the experiences of the co-authors, include not fully addressing all key stakeholders when initiating reforms to encourage the prescribing and dis­pensing of generics as seen in Abu Dhabi, see Table 4. However, this is now being addressed. In addition, not allowing phar­macists to dispense the cheapest drug once multiple sources are available, which is typically a generic versus an originator drug, in all but a minority of situations that could compromise patient care. Alongside this, delaying the instigation of measures to enhance INN prescribing, compulsory substitution, as well as other measures to enhance the prescribing of particular generics need to be discussed and agreed in advance of their availability, to enhance physician acceptance as seen in Abu Dhabi, Austria and Sweden [7, 14, 17, 49]. Other pitfalls to avoid include long delays between marketing authorisation and the reimbursement of a generic drug . These issues are also currently being addressed to enable payers to take full ﬁnancial advantage of the availability of generics. There have also been situations where generics companies have been able to launch new generics ahead of patent loss by launching them in different salts to those of the originator such as generic clopidogrel. This is outside the scope of this paper, but has been explored elsewhere in this issue of the GaBI Journal. As discussed, we accept there are limitations with the study design. However, we believe the selected case histories provide useful lessons to other countries regarding which measures could potentially further enhance their prescribing efficiency. The sharing of information about potential policies and measures is vital if Europe is to maintain the ideals of comprehensive and equitable health care. Similarly, in the US, given current ﬁnan­cial concerns, there is a greater need than ever before for further measures to help stem the rise in pharmaceutical expenditure. Payers across countries have successfully introduced multiple supply- and demand-side measures to improve prescribing efficiency through increased use of generics versus originators and patent-protected products in the same or related classes as well as measures to obtain low prices for generics. As a result, they are increasingly able to take full advantage of the availability of generics. However, this has not always been possible. It is important though that countries continually share their experiences, and even start to accelerate the sharing of lessons learned about which policies and new measures appear the most effective, as resource pressures grow. The alternative is insufﬁcient funds to cover the costs of increased drug volumes or new innova­tive drugs, both of which are not in the best interests of all key stakeholder groups. Expenditure on pharmaceuticals is a growing concern among health authorities and health insurance agencies as it is now the largest or equalling the largest component of expenditure in ambulatory, i.e. non-hospital, care. In addition, utilisation and expenditure on pharmaceuticals will continue growing driven by a number of factors including ageing populations, and hence a growing prevalence of chronic diseases leading to greater use of drugs, as well as new drugs being launched that are typically more expensive than existing drugs. Consequently, health authorities and health insurance agencies welcome the availability of generics as these are priced lower than the originators to help ease resource pressures especially in these difficult economic times. However, the extent of the pre­scribing and dispensing of generics versus originators, as well as similar patent protected drugs in the same class to treat the same patients, varies considerably among countries. This can be due to concerns with the effectiveness of generics versus originators. However, this has been found not to be the case in extensive studies, especially with the tests required by the authorities to demonstrate similar bioavailability between generics and origi­nators before products are launched onto the market. There are also considerable differences in the prices of generics among countries. Health authorities and health insurance agencies need to tackle both these issue to release considerable resources to help fund comprehensive and equitable health care particularly in Europe without prohibitive increases in either taxes or health insurance premiums. Consequently, they need to learn from each other with respect to measures that have been successful in other countries to enhance the prescribing and dispensing of generics at increasingly lower prices, as well as the pitfalls to avoid. The case histories described in this paper help them to achieve this aim. All authors have been especially invited for their direct role in introducing policy initiatives with regard to generics in their regions or countries, drawn from relevant health authorities or health insurance companies and their advisers. All authors have taken full part in the compilation and production of this paper. Mohammed Abuelkhair (Abu Dhabi), Agnes Vitry (Australia), Shajahan Abdu (Abu Dhabi), Marion Bennie (Scotland, UK), Iain Bishop (Scotland, UK), Sahar Fahmy (Abu Dhabi), Karuoliene Garuoliene (Lithuania), Harald Herholz (Germany), Saira Jan (USA), Andrew Martin (UK), Rickard Malmström (Sweden), Ulrich Schwabe (Germany), Catherine Sermet (France), Peter Skiöld (Sweden), Luka Von ina (Croatia), are employed directly by health authorities, physician associations (Germany) or health insurance agencies, or are advisers to these organisations. No author has any other relevant afﬁliation or ﬁnancial involvement with any organisation or entity with a ﬁnancial interest in or ﬁnancial conﬂict with the subject matter or materials discussed in the manuscript. No writing assistance from commercial organisations was utilised in the production of this manuscript. This study was in part supported by grants from the Karolinska Institutet. Cameron A, Ewen M, Ross-Degnan D, Ball D, Laing R. Medicine prices, availability and affordability in 36 developing and middle-income countries; a secondary analysis. Lancet. 2009;373(9659):240-9. Sermet C, Andrieu V, Godman B, et al. Ongoing pharmaceutical reforms in France; implications for key stakeholder groups. Appl Health Econ Health Policy. 2010;8:7-24. Godman B, Shrank W, Andersen M, et al. Comparing policies to enhance prescribing efficiency in Europe through increasing generic utilization: changes seen and global implications. Expert Rev Pharmacoecon Outcomes Res. 2010;10(6):707-22. Godman B, Burkhardt T, Bucsics A, et al. Impact of recent reforms in Austria on utilization and expenditure of PPIs and lipid lowering drugs; implications for the future. Expert Rev Pharmacoecon Outcomes Res. 2009;9(5):475-84. Godman B, Wettermark B, Hoffman M, et al. Multifaceted national and regional drug reforms and initiatives in ambulatory care in Sweden; global relevance. Expert Rev Pharmacoecon Outcomes Res. 2009;9(1):65-83. McGinn D, Godman B, Lonsdale J, et al. Initiatives to enhance the quality and efficiency of statin and PPI prescribing in the UK: impact and implications. Expert Rev Pharmacoecon Outcomes Res. 2010;10(1):73-85. Garuoliene K, Godman, B, Gulbinovi J, et al. European countries with small populations can obtain low prices for drugs: Lithuania as a case history. Expert Rev Pharmacoecon Outcomes Res. 2011;11(3):343-9. Voncˇina L, Strizrep T, Godman B, Bennie M, et al. Influence of demand-side measures to enhance renin-angiotensin prescribing efficiency in Europe: implications for the future. Expert Rev Pharmacoecon Outcomes Res. 2011;11(4):469-79. Garuoliene K, Alonderis T, Marcinkevi ius M. Pharmaceutical policy and the effects of the economic crisis: Lithuania. Eurohealth. 2011;17:1-4. Voncina L, Strizrep T. Croatia: 2009/2010 pharmaceutical pricing and reimbursement forum. Eurohealth. 2011;16(4):20-2. Godman B, Bucsics A, Burkhardt T, Haycox A, Seyfried H, Wieninger P. Insight into recent reforms and initiatives in Austria; implications for key stakeholders. Expert Rev Pharmacoecon Outcomes Res. 2008;8(4):357-71. Godman B, Schwabe U, Selke G, Wettermark B. Update of recent reforms in Germany to enhance the quality and efficiency of prescribing of proton pump inhibitors and lipid lowering drugs. Pharmacoeconomics. 2009;27(5): 435-8. 16. Coma A, Zara C, Godman B, Augusti A, Diogene E, et al. Policies to enhance the efficiency of prescribing in the Spanish Catalan region: impact and future direction. Expert Rev Pharmacoecon Outcomes Res. 2009;9(6):569-81. Abuelkhair M, Abdu S, Godman B, et al. Imperative to consider multiple initiatives to maximize prescribing efficiency from generic availability: case history from Abu Dhabi. Expert Rev Pharmacoecon Outcomes Res. 2012;12(1):115-24. Godman B, Malmstrom RE, Bennie M, Sakshaug S, et al. Prescribing restrictions – a necessary strategy among some European countries to enhance future prescribing efficiency? Reviews in Health Care. 2012;3(1):5-16. 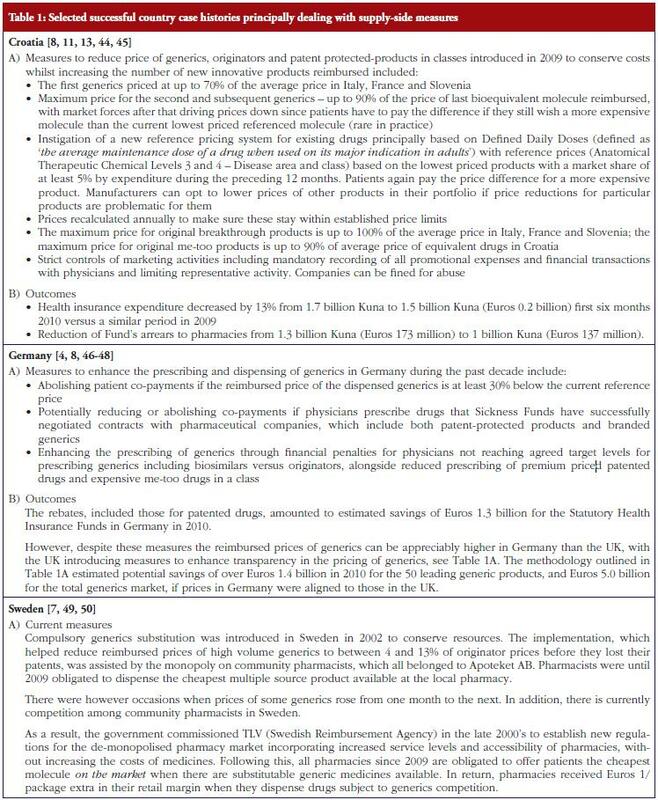 Simoens S. International comparison of generic medicine prices. Curr Med Res Opin. 2007;23:2647-54. Duerden M, Hughes D. Generic and therapeutic substitutions in the UK: are they a good thing? Br J Clin Pharmacol. 2010;70(3):335-41. 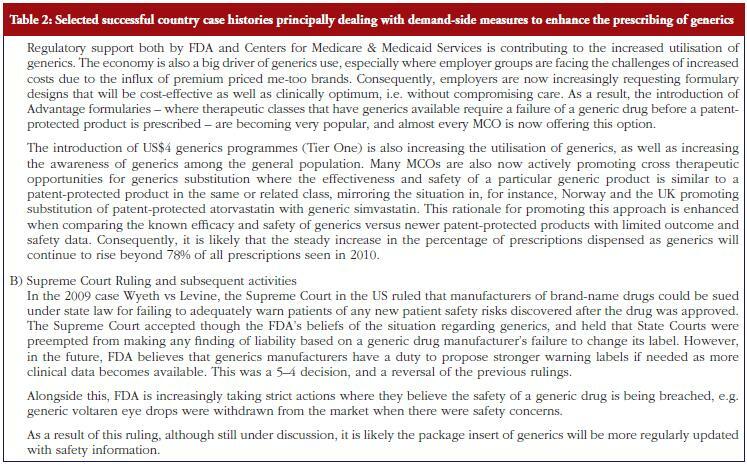 Simoens, S. Trends in generic prescribing and dispensing in Europe. Exp Rev Clin Pharmacol. 2008;1(4):497-503. Kesselheim A, Stedman M, Bubrick E, et al. Seizure outcomes following the use of generic vs. brand-name antiepileptic drugs. A systematic review and meta-analysis. Drugs. 2010;70(5):605-21. Kesselheim A, Misoni A, Lee J, et al. Clinical equivalence of generic and brand-name drugs used in cardiovascular disease – a systematic review and meta-analysis. JAMA. 2008;300:2514-26. Shrank WH, Hoang T, Ettner S, et al. The Implications of Choice – Prescribing generic or preferred pharmaceuticals improves medication adherence for chronic conditions. Arch Intern Med. 2006;166:332-7. Shrank WH, Libermann JN, Fischer M, et al. The consequences of requesting ‘dispense as written’. Am J Med. 2011;124:309-17. Heikkilä R, Mäntyselkä P, Hartikainen-Herranen K, Ahonen R. Customers’ and physicians’ opinions of experiences with generic substitution during the first year in Finland. Health Policy. 2007;82(3):366-74. Figueiras M, Alves N, Marcelino D, Cortes M, et al. Assessing lay beliefs about generic medicines: development of the generic medicines scale. Psychol Health Med. 2009;14(3):311-21. Simoens S. Interchangeability of off-patent medicines: a pharmacoeconomic perspective. Expert Rev Pharmacoecon Outcomes Res. 2008;8(6):519-21. Shrank W, Cox E, Fischer M, et al. Patients’ perception of generic medications. Health Affairs. 2009;28:546-56. Shrank W, Cadarette S, Cox E, Fischer M, Metha J, et al. Is there a relationship between patient beliefs or communication about generic drugs and medication utilization? Med Care. 2009;47(3):319-25. Kjoenniksen I, Lindbaek M, Grannas A. Patients’ attitudes towards and experiences of generic drug substitution in Norway. Pharm World Sci. 2006;28(5):284-9. Andersson K, Sonesson C, Petzold M, et al. What are the obstacles to generic substitution? An assessment of the behaviour of prescribers, patients and pharmacies during the first year of generic substitution in Sweden. Pharmacoepidemiol Drug Saf. 2005;14:341-8. Tsiantou V, Zavras D, Kousoulakou H, et al. Generic medicines: Greek physicians’ perceptions and prescribing policies. J Clin Pharm Ther. 2009;34(5):547-54. Morel C, McGuire A, Mossialos E. The level of income appears to have no consistent bearing on pharmaceutical prices across countries. Health Affairs. 2011;30(8):1545-52. Bennie M, Godman B, Bishop I, Campbell S. Multiple initiatives continue to enhance the prescribing efficiency for the proton pump inhibitors and statins in Scotland. Expert Rev Pharmacoecon Outcomes Res. 2012;12:125-30. Godman B, Haycox A, Schwabe U, et al. Having your cake and eating it: Office of Fair Trading proposal for funding new drugs to benefit patients and innovative companies. Pharmacoeconomics. 2008;26(2):91-8. Schwabe U. Arzneiverordnungs 2010 im Uberlick. In: Schwabe U, Paffrath D. Arzneiverordnungs Report 2011. Berlin, Heidelberg: Springer-Verlag GmBH;2011. pp. 3-42. Wettermark B, Godman B, Andersson K, et al. Recent national and regional drug reforms in Sweden: implications for pharmaceutical companies in Europe. Pharmacoeconomics. 2008;26(7):537-50. La maîtrise des dépenses de Medicaments 2010. Available via URL: http://www.ccomptes.fr/fr/CC/documents/RELFSS/Rapport_securite_sociale_2011_maitrise_depenses_medicaments_4.pdf [Accessed 22 May 2012]. Glantz L, Annas G. Impossible? Outlawing state safety laws for generic drugs. N Engl J Med. 2011;365(8):681-3. Godman B, Sakshaug S, Berg C, Wettermark B, Haycox A. Combination of prescribing restrictions and policies to engineer low prices to reduce reimbursement costs. Expert Rev Pharmacoecon Outcomes Res. 2011;11:121-9. Godman B, Wettermark B, Bennie M, Burkhardt T, Garuoliene K, et al. Enhancing prescribing efficiency through increased utilisation of generics at low price. (E)Hospital. 2011;13;3:28-31. McKee M, Stuckler D, Martin-Moren J. Protecting health in hard times. BMJ. 2010:341;681-2. Moon J, Flett A, Godman B, et al. Getting better value from the NHS drug budget. BMJ. 2011;342:30-2. Abuelkhair M, Fahmy S, Godman B, Abdu S, Gustafsson LL. Cross national comparative drug utilisation studies demonstrate potential efficiency gains in Abu Dhabi. Pharmacoepidemiol Drug Saf. 2011;20:S96. Shrank W, Choudhry N, Agnew-Blais J, Federman A, et al. State generic substitution laws can lower drug outlays under Medicaid. Health Aff (Millwood). 2010;29:1383-90. Gustafsson LL, Wettermark B, Godman B, Andersén-Karlsson E, Bergman U, et al. The ‘Wise List’ – a comprehensive concept to select, communicate and achieve adherence to recommendations of essential drugs in ambulatory care in Stockholm. Basic Clin Pharmacol Toxicol. 2011;108(4):224-33. Norman C, Zarrinkoub R, Hasselström J, Godman B, Granath F, Wettermark B. Potential savings without compromising the quality of care. Int J Clin Pract. 2009:63(9):1320-6. Frisk P, Rydberg T, Carlsten A, Ekedahl A. Patients’ experiences with generic substitution: a Swedish pharmacy survey. JPHSR. 2011;2(1):9-15. I like the helpful information you supply in your articles. I will bookmark your weblog and take a look at it regularly. I’m relatively certain I’ll be told a lot of new and accurate information here! Good luck for the following! Thank you for your kind comments. We will be building on this article in further issues of GaBI.